Exploring the diverse world of Pollination - What is a Solitary Native Bee? What is a Native bee? Native bees are bees that have evolved in a specific region and have become locally adapted to the climate and forage of that region. 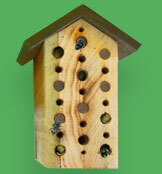 Native bees are usually the best pollinators for plants that are native to the same region. Squash bees (Peponapis) and bumble bees (Bombus) are an excellent example of bees that pollinate plants native to the americas. The timing of emergence, foraging habits, the physiology and the behavior of squash bees are ideal for pollinating squash, while bumble bees are ideal pollinators for tomatoes. Squash and Tomatoes are crops that are native to the americas. While native bees may be ideal for native crops, they may also be ideal for many non-native crops. Squash bees for instance, are very effective pollinators of watermelon, a fruit that is native to southern Africa. Some beneficial bees may not be truly native to your area but may have been introduced for pollination, such as the alfalfa leaf-cutting bee (Megachile rotundata). Organisms such as flies and wasps are also worthy of mention, and alhough they are not bees, they may be both native and perform pollination. Wasps and flies may begin pollinating earlier in the growing season than bees and so fill a unique pollination niche. Distinguishing between bees, wasps and flies. Generally speaking, wasps and flies do not actively collect pollen, but rather pollinate incidentally while foraging for nectar and food. Bees on the other hand, actively collect pollen to feed to their offspring. Wasps are carnivores that hunt for bugs to feed to their offspring (or to lay eggs on) while bees collect and feed pollen to their offspring (or lay eggs on). Bees have branched hair and look fuzzy, while wasps usually have smooth single hairs or no hair at all. The two most common bees that give native bees a bad name are the Yellow-Jacket wasps and Carpenter bees. The main reasons for Yellow Jacket wasps (Vespinae) becoming a pest is because they are social and thus 'defensive', dwell in the ground where grass is often mowed and are very attracted to sweet liquids such as soda, but also to meat. As a result, we tend to maintain an adversarial exsitence with them. Carpenter bees (Xylocopinae) are frequently a pest to homeowners who dislike the large holes they burrow into wooden eves, decks or other wooden garden structures. What Kinds of Bees Will You See? "There are more species of bees in the world than all mammal and bird species combined. In North America there are around 4,000 species of bees. In Missouri there are over 400 species of bees, including 10 species of bumblebees. Honey bees are an exotic species first introduced into the New World in 1622. Pollinators are often keystone species, meaning that they are critical to an ecosystem. As landscapes are converted from wild to managed lands, many pollinators' habitats may be destroyed or fragmented." • Maximize flower space and plant species diversity. • Provide a succession of blooming plants throughout the growing season, spring through fall. • Provide a mix of flower shapes to accommodate different species. • Emphasize native perennial plants. • Plant host plants to feed caterpillars as well as nectar plants for adult butterflies. • Avoid horticultural plants, such as marigolds and roses, bred as "doubles" that provide little or no pollen and nectar. • Choose non-chemical solutions to insect problems. 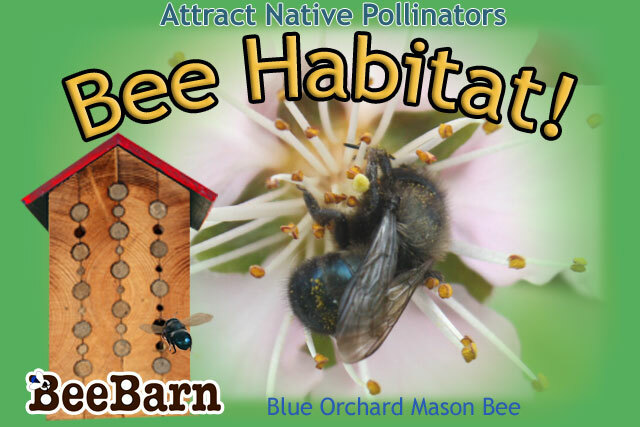 • Provide nesting habitat for bees, such as bare ground for digger and sweat bees and wood and dried plant stems for leaf cutter and carpenter bees. • Practice peaceful coexistence. Bees sometimes choose to nest in inconvenient places. Rather than exterminating them, think of it as an opportunity to see and learn about them up close. Over time, many plants have developed pollination systems that depend on bees. Missouri examples include most of the flowers in the bean family (Fabaceae), the daisy family (Asteraceae), the rose family (Rosaceae), gentians and many others. Many native fruits eaten by birds and other wildlife develop from flowers that are bee-pollinated, such as blueberries, plums, serviceberries, buckthorns and ground cherries. Some flowers require certain kinds or sizes of bees for pollination. Wild indigos, which are common on prairies and glades, have large flowers that can be pollinated only by large, strong bees, primarily queen bumblebees. Pollinators are essential to our environment. The ecological service they provide is necessary for the reproduction of nearly 70 percent of the world’s flowering plants, including more than two-thirds of the world’s crop species. The United States alone grows more than one hundred crops that either need or benefit from pollinators, and the economic value of these native pollinators is estimated at $3 billion per year in the U.S. Beyond agriculture, pollinators are keystone species in most terrestrial ecosystems. Fruits and seeds derived from insect pollination are a major part of the diet of approximately 25 percent of all birds, and of mammals ranging from red-backed voles to grizzly bears. In many places, the essential service of pollination is at risk from habitat loss, pesticide use, and introduced diseases.